A couple of important supply deals have been signed this month. 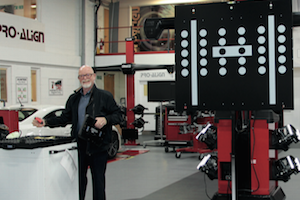 First, around-the- wheel kit dealer, Pro-Align, has arranged with diagnostic tool maker Texa to supply the latter’s new aftermarket ADAS system. As the wheel alignment company has a contacts book full of past and existing customers in the crash repair and tyre fitting markets, it seems like an obvious add-on. Pro-Align will also carry Texa’s range of diagnostic equipment.“Texa is pleased to welcome Pro-Align to its’ distribution network, where they are ideally placed to offer a complete service to OE and professional workshops facing the challenges of repairing newer vehicles fitted with Advanced Driver Assistance Systems,” commented Dave Gordon, Texa’s OE and National Accounts Sales Manager.